I feel strangely excited, and of course I’m going to tell you why. It has to do with the election. Wait! Wait! Don’t tune out! I’m not going to tell you about my humble beginnings and how I love America more than anybody else does, and I’m not going to ask for a small donation. It’s a little hard to articulate, but I feel genuinely hopeful about this. It seems to me that, in some way, the needs of the people – the very human needs of all the people – is shaping the rhetoric of the election in a way that I don’t remember happening before on this level. (Of course that might be because my memory is full of holes and I’m politically dumb as a bag of flour.) Feminists have talked for decades about the personal being political, which is an idea that I embrace. This election cycle, (as they call it, which also makes it seem human and part of nature, somehow) it seems as though all of the politicians are struggling to connect with us by making the political personal. Maybe it’s the healthcare debate. Whatever your feelings on the subject, I think everybody agrees that healthcare is about us at our most human and most vulnerable. Of course it’s also about insurance companies and corporations, but at its most crucial, it’s about our life and our death, our bodies and our well-being. I think it’s hard not to become emotional when we consider this issue, which makes it difficult to discuss rationally, perhaps, but it’s important for us to learn this form of discourse – to learn to talk about personal emotional subjects. Maybe it’s because times have been so hard for all of us. We’re all hurting, and it makes us more insular, for better or for worse. We’re anxious about our homes, and our ability to keep them. We’re thinking about the food we put on our table. And this election is about women. We’re told over and over that the women are going to decide this election, and that’s forced a (sometimes uncomfortable) discussion about women’s bodies, and women’s work, and the value of that work. Of course, everything’s intimately connected. The “serious” issues of war, taxes, foreign policy – they’re all ultimately personal, they’re about our daily lives, our loves, our families, the chance to follow the path to old age that we all travel together. I always have this feeling, when I listen to politicians talk, that there’s a truth and sense that they can’t tell us with their words, that we hear anyway. Sometimes they try to hide it – when they tell us we need to go to war, with a barrage of words and falsified facts, I feel like most people understand the truth anyway – we know their motives. This year I feel the sense is closer to the surface under the muddle of words – the sense that we’re all in it together, and we’ll learn a way to talk about that. CRUST – one batch pate brisee, add 1 t minced rosemary. 1 heaping cup of french lentils, cooked like this, with plenty of shallots and garlic. You won’t use the whole batch, but this is a good way to use up leftover french lentils. If you make a fresh batch for this, the rest are wonderful tossed in a sald or with pasta, or just eaten as a side dish. Warm the butter in a small frying pan over medium heat. When it starts to brown, add the sage leaves and cook till they’re sizzly. Add the lentils and stir and cook till they’re quite warmed through. Add the port and balsamic, and cook till they’re reduced and syrupy. Keep cooking until the pan is quite dry, and remove from the heat. Preheat the oven to 425. Toss the mushrooms with the olive oil and herbs, and spread them in a single layer on the sheet. Cook for about 20 minutes till they’re crispy and brown. Set aside. Roll out the dough to be about 1/4 inch thick. Butter and flour your tart pan, and spread the dough evenly inside and up the sides, cutting off the extra. Slash it in a few places, or prick with a fork. Prebake your tart shell for about ten minutes, pressing the dough back up the sides if it starts to sag. I find, with a tart pan, it makes it a bit easier to put the whole tart pan on a cookie sheet, if you can fit it. Spread the lentils in an even layer on the bottom of the tart pan. Arrange the mushrooms over the lentils. Pour the custard over everything. If you like, arrange a few sage leaves on top for decoration. Bake for about 20 – 30 minutes, till the top is puffed and golden. Let it cool for a minute before you remove the outside of the tart pan. 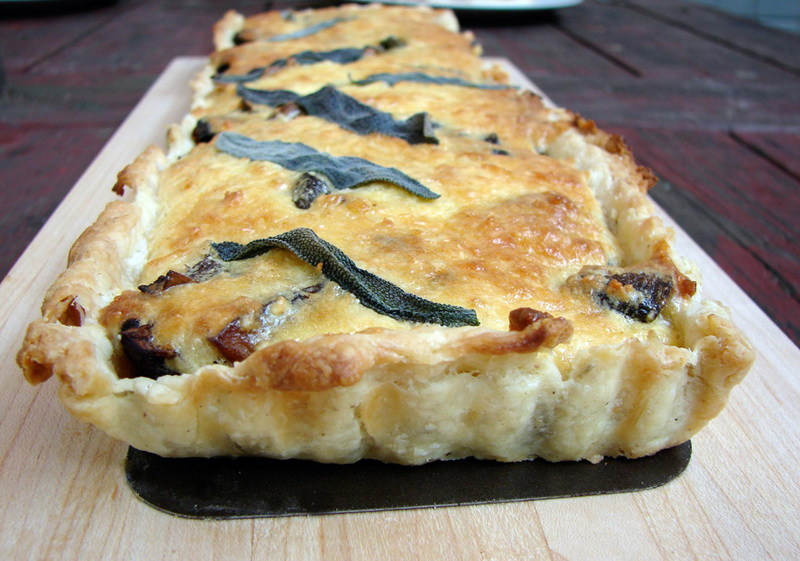 This entry was posted in crust, lentil, mushrooms, pie and tagged french lentils, port wine, roasted mushrooms, rosemary, sage, savory frangipane, savory tart by Claire. Bookmark the permalink. this looks delicious! i believe i might be ready to try your technique for crust. It’s so easy, and fun, even! I think I had a dream about your dogs! How large is your tart pan? I’m looking forward to trying this recipe for camp cooking for a crowd, and am wondering how many each one will serve. Also, I assume it’s tasty at room temperature, or would you recommend warming it? My tart pan is 14 inches by 4 inches. I’m horrible at math, but I think it would translate to a 9 or 10 inch round tart pan. (Maybe my ten year old son can help me figure it out!) I think that one would serve 4 or 5 people as a main course (with some salad or potatoes or something) and maybe 6 or 7 sliced more thinly as an appetizer. And I think it would be fine at room temperature! Awesome, thanks for the reply and info. I hope it works out for you!! It was fantastic, by the way. I’ll admit I cheated and just used my standard pie dough recipe, though my first attempt had the dough slouch way down and be pretty much unusable. Serves me right for getting distracted and walking away from the oven. The second batch turned out okay. I also couldn’t seem to find a tart pan, so I hoped for the best and tossed it all in a large loaf pan. And I had more lentils than I needed, so I added those too. Okay, so I didn’t really follow your recipe terribly faithfully. It seemed like the custard couldn’t have possibly been enough for the quantity of filling, but it totally worked out beautifully. I wound up freezing it for transit and then thawing it in the sun before lunchtime, and everyone raved. New favorite veg-friendly recipe! Pingback: lighter quiche | joy she cooks. Discovered your blog in time to make this for Thanksgiving. It was excellent. Loved the layers of flavors. Lentils are my favorite and your method of cooking them gave me a lot of tasty broth that I used a base for a mushroom soup. Thank you. Thanks so much for taking the time to let me know it worked out! I’m glad you liked it. Lentils are my favorite, too!